Abstract: Cassava (Manihot esculenta) Crantz is one of the most important root crops worldwide, providing a staple food source for over 700 million people in Africa, Asia and South America (www.faostat.fao.org). Despite its widespread use better varieties with improved tolerance to biotic and abiotic stresses, enhanced nutritional properties, improved post-harvest properties and high yields/productivity are required urgently to address food security needs. Unlike other crops (e.g. tomato) the tools and resources necessary for the rapid and rational development of new varieties are not available in Cassava. 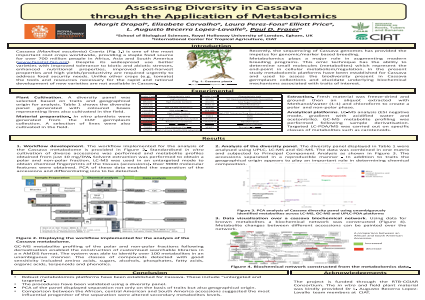 Recently, the sequencing of Cassava genomes has provided the impetus for genomic/marker based breeding.